Last month I created a new workspace for my miniatures and scale model making endeavors. The House of Miniatures™ kits are not my only hobby. I also enjoy creating miniature rooms, complete houses, HO scale buildings, and the occasional model car. So my miniatures workspaces need to be flexible, but not very large. This is the finished picture of the space. Well, nearly finished. This corner started out as an “office” space, which is a general term that doesn’t hold a lot of meaning, just expansive potential. That potential is usually realized as a place to drop miscellaneous junk. 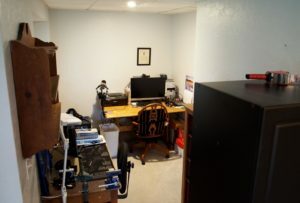 It became a place to store and clean firearms, work various computer projects, and store office supplies and batteries. There was also an audio/video recording area, photo studio… whatever I was doing at any time sort of got dropped in there. Books and magazines piled up, too, and a lot of dust. Mostly dust. So, I decided to do a reboot. 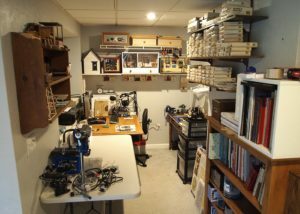 For reference, here are a couple of pictures of my previous, expansive, basement miniatures workspaces in our house in Maine. 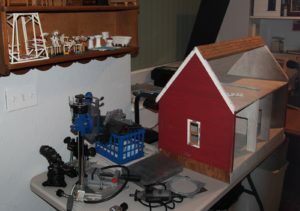 There were spaces to set up every tool, store all of the supplies, and to have three or four projects going at once. It was a cool place and it was great fun to be surrounded by some of my favorite toys… er, hobbies! Imagine these four shots as the four sides of a box, 3X the footprint of my current space. Unfortunately, since moving to the Cincinnati area six years ago, I never got the gumption up to try to recreate that type or size of shop. I’ve reduced the number of toys and projects and I’ve left off building rooms and boxes and model cars, for the most part. I had a little table that I built some HO building on and I did a little work on a couple of THoM kits, but I hadn’t really gotten my mini mojo back. 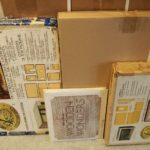 In fact, in September 2017 I got out my THoM kits with the idea of selling most of them. But it was too painful. So I got back into working on the THoM web site and that slowly brought back my desire to start building again. And that necessitated coming up with a new miniatures workshop design. There are three types of surfaces in this space. First, a small work bench with great lighting, vises and jigs, access to clamps [see my jigs and clamps article], and tools right at hand. Any THoM kit can be built right here, including gluing, hand sanding, staining, and finishing. The lighting is adjustable. I have magnifiers for detail work. I can swap out the magnetic jig for a drop cloth quickly, and ventilation (in the form of a window) is right behind me. 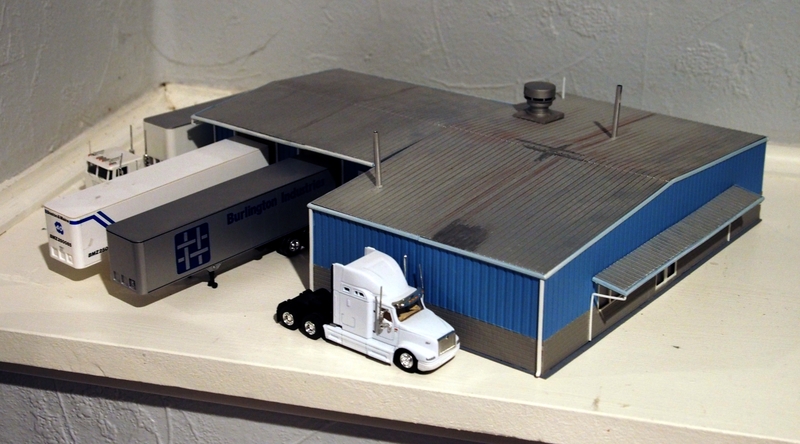 Then there is a larger surface for bigger projects, like roomboxes and dollhouses. It can also serve as a second project space when I have two things going at once and need to swap around. Right now I’m using it as sorting space for my HO building materials. The third surface is administrative, somewhere I can open a book, do some research, sit and type a blog article, or work with pictures. I can also set up a desktop photographic lightbox for a quick product photo shoot if needed. A computer, monitors, and a printer round out this surface. There are also three types of shelves in this space. 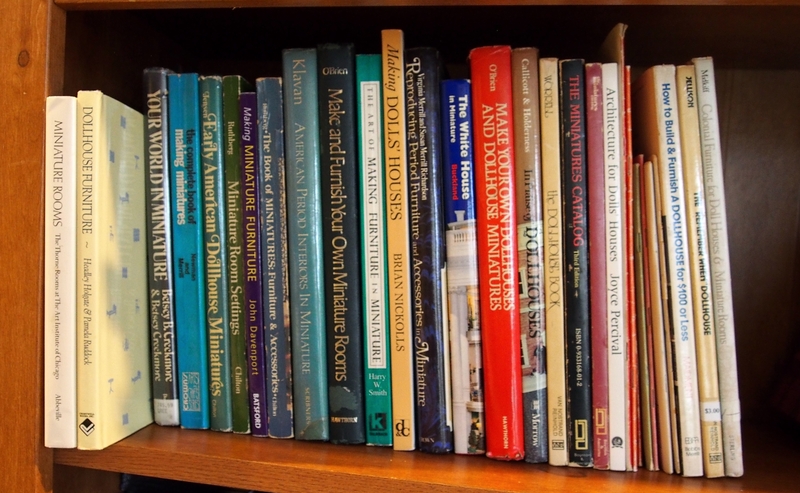 Bookshelves are a big deal to me because I like big, hefty reference books full of detailed pictures and drawings. 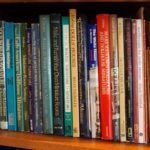 Yes, I could likely find most of the images with a Google search, but there is still something about reference books that inspires me in a way that an endless, scrolling window of random images or series of fluffy articles full of banner ads can’t do. Then there are display shelves. I love to see my miniatures. My miniatures workspace is part art gallery, really, with several sizes of shelves to display built THoM kits, roomboxes, both finished and in progress, and even a shelf that looks like a house with tiny rooms where I display random miniatures and a couple of small scale cars. Then there are the special purpose shelves, which are unique to collectors of kits, I think. 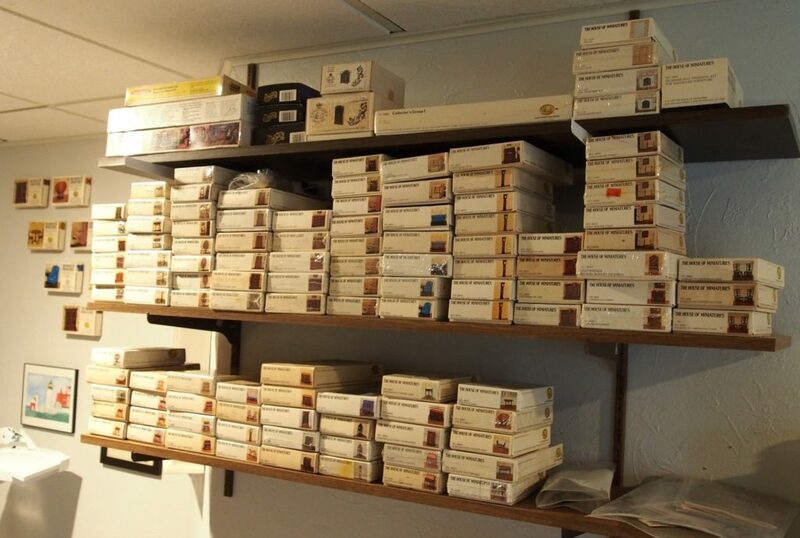 Below you see three shelves stuffed with The House of Miniatures™, in numerical order, of course. This is a hybrid of storage space and display shelf. It is a notice to the world, telling anyone who will listen (mostly myself) that this is what I intend to do, far into my dotage! Having room for everything can be a challenge. Miniatures workspaces can become cluttered quickly. I like to use the wall space and stack things high so that I can see as much as possible. These shelves double as display space for my finished roomboxes and storage space for work in progress. The kit boxes hanging on the wall are empty ones. I them turn into “objecto de arto” after building the kits. Drawers (or bins) are best for small things or items that roll around. If I had a bit more room for deeper shelves, I’d prefer to keep all of the things in these drawers in bins for ease of access. But this unit fit fine in the little corner I have for it. There’s a little room for plastic tubs under the large table. I prefer clear tubs so that I can get a good idea of what’s in each one before I open it. 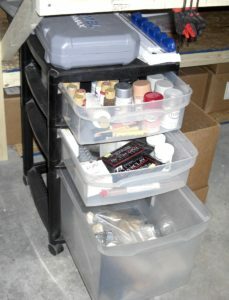 I store dollhouse building and decorating supplies in those, plus a few model cars. Also some building supplies for HO scale industrial buildings like this one. floor space is a valuable commodity for storage. 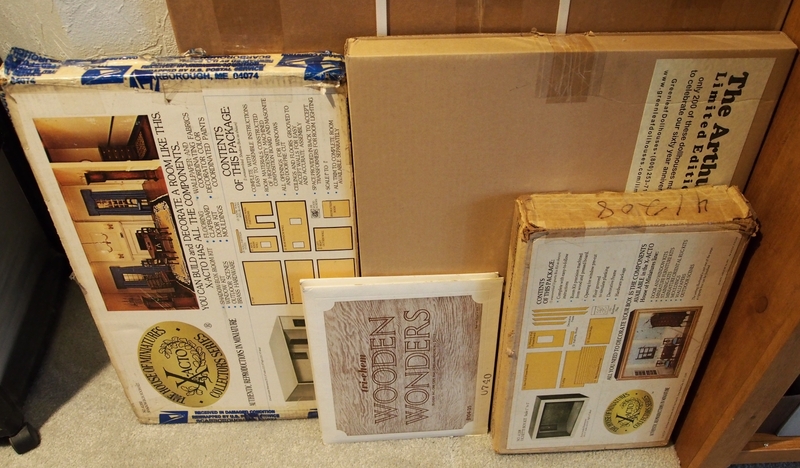 I have a bunch of flat boxes that are best stored standing against a wall. 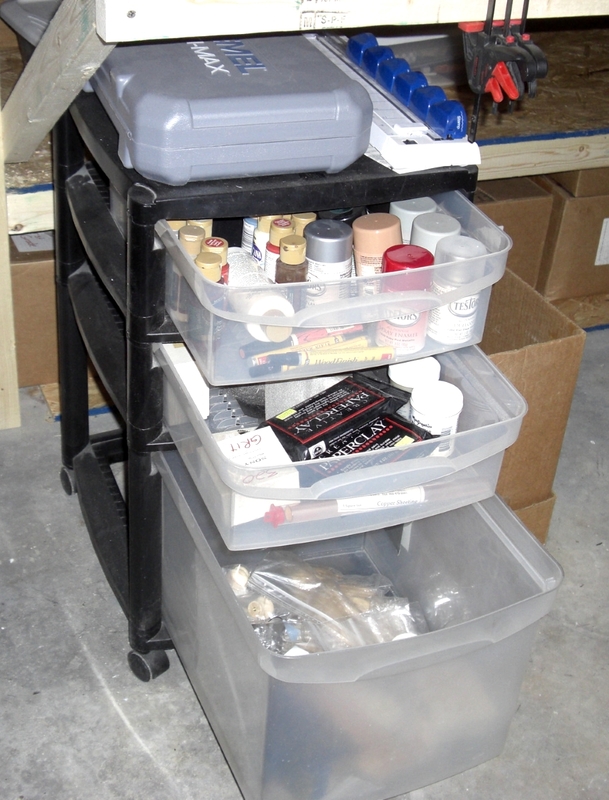 Dollhouses, roomboxes, foam core board, and supplies in tubes fit nicely into a little corner like the one pictured. Then there is the cold storage, as I like to call it. 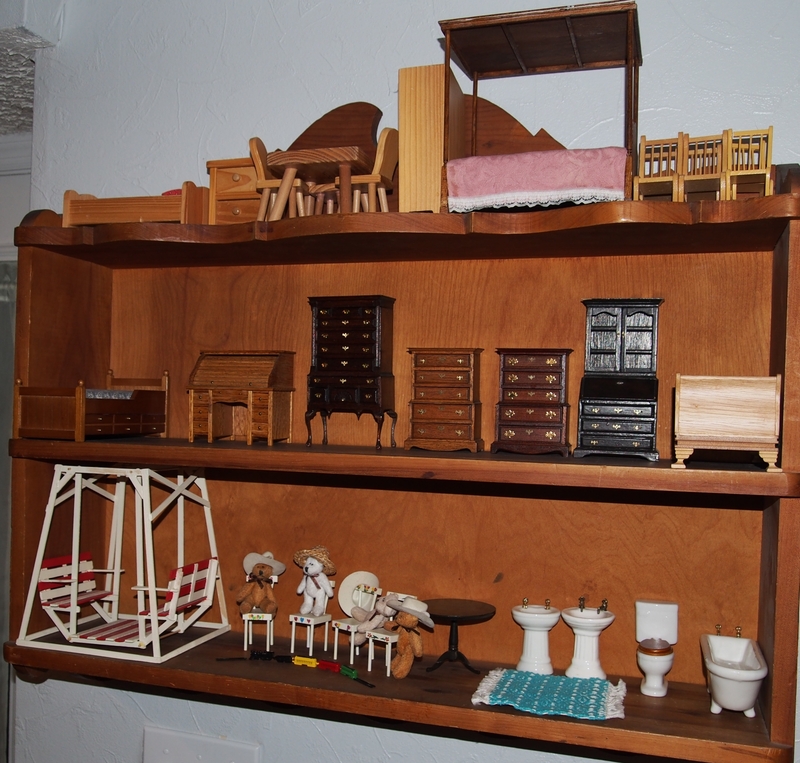 Finished (or partially finished) dollhouses have to live somewhere. 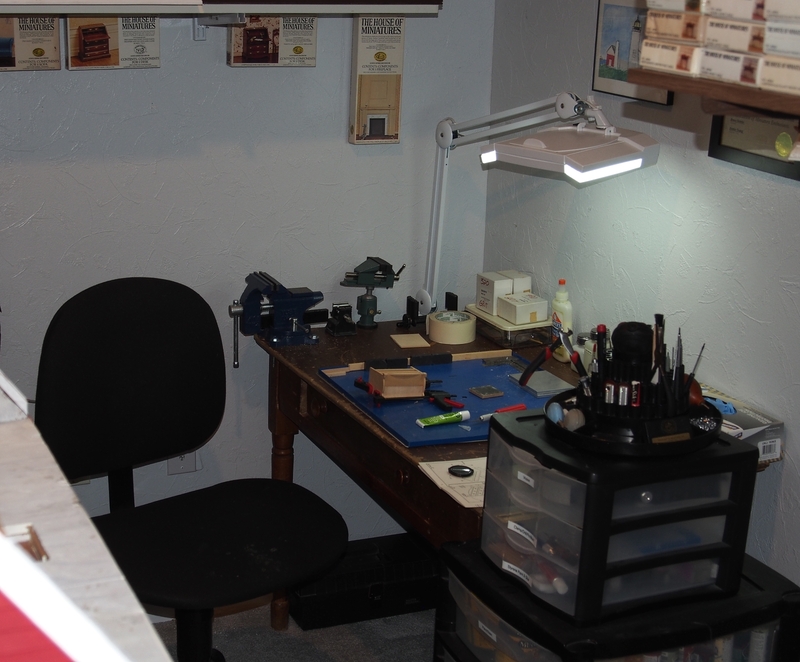 I couldn’t find room for that big, red, Cape Cod house or my daughter’s log cabin anywhere in my little work area. So, they will be banished to a shelf in the garage or under the basement stairs. 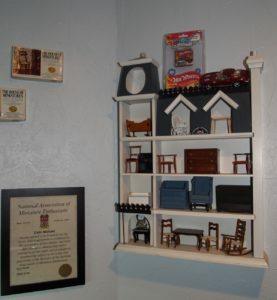 Some people have a room just for displaying their handiwork. I have that on my to-do list, but I don’t think it will happen this year. So, what does your miniatures workspace look like? 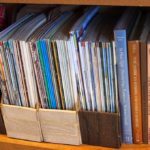 Do you use the corner of a desk, or set up on the kitchen table a day at a time (I’ve tried both)? Does your sewing room do double duty? I’d like to hear your experience and your tips for finding or using space. Please join the discussion below or join the Facebook Group where we have a special section about miniatures workspaces.